Joe and Melissa Basilone outside of Thrift & Thrive. Not long after moving from Chicago’s Ukrainian Village neighborhood to Portage Park in the far northwest side of the city in 2007, Joe and Melissa Basilone found themselves constantly returning to their old neighborhood for things to do. 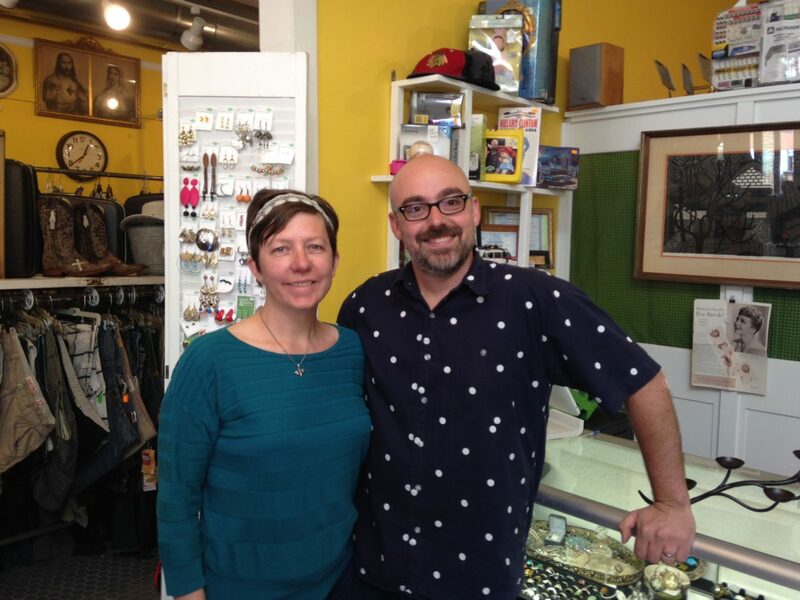 In 2011, that’s exactly what the Basilone’s did, opening resale shop Thrift & Thrive. The store, which still is going strong at 6025 W. Irving Park Road, is the first Chicago business the Basilone’s opened. Three years later, the corner storefront across the street at 6032 W. Irving Park became available and Basilone’s decided to take another risk and open Perkolator Coffee, a coffee shop. In October 2015, the Basilone’s rented the storefront next to Perkolator and opened Sputnik Books & Records, a used book and record store. Now they are about to open their fourth business, Charley Noble, a deli at 6011 W. Irving Park, cementing their position as the business barons of the Irving and Austin intersection. Melissa and Joe inside Thrift & Thrive. Basilone, now 39, grew up in the suburbs of New York City and moved to Florida at the age of 16. In New York, he got his first taste of small business, working in delicatessens that his father owned. Then, while attending the University of Florida, Basilone took his first risk and dropped out of school to buy into the coffee shop that was a hangout for him. Basilone, who sang and played guitar in Vini and the Demons, a blues band, decided to move to Chicago in 2001. Joe, whose stage persona was “Joey Demon,” made sure he didn’t leave Florida without Melissa, his girlfriend at the time, and covered his bases by proposing before they moved. They had been friends for a few years before dating — Melissa first met Joe from being a customer at Joe’s coffee shop and dated for a year before getting engaged. “I was going to propose anyway but I wanted to make sure that if I was going to take this girl 1,400 miles away from home it was for a good reason,” Basilone said. Melissa, who grew up in New Mexico, graduated from the University of Florida with an English degree. Growing up, her family, like Joe’s, also ran a small business. Upon moving to Chicago with Joe, she worked several years as an editor for Arcadia Publishing but said she too wanted to eventually run her own business. As for the band, Basilone said it wasn’t long after they arrived in Chicago that things started going sideways. “What we were doing in Florida was really revolutionary and cutting edge for the time. I feel like had we stayed on track we would have been right up there with The White Stripes. We had a cool thing going on,” Basilone said. 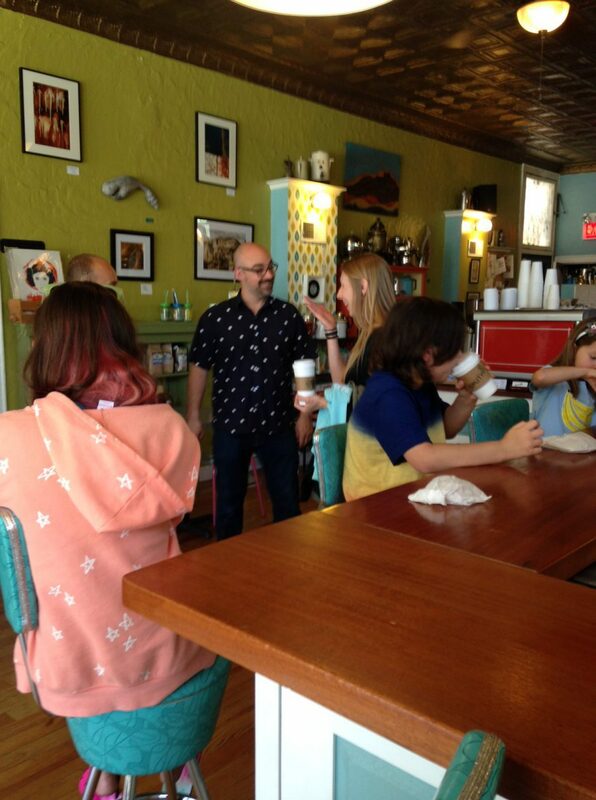 Joe holding court with customers at Perkolator. While in the band, Joe had been bartending at Rosa’s and Melissa worked part-time there as a cocktail waitress. After leaving the band, Basilone started working for Caribou Coffee where he rose to market manager, responsible for 25 Caribou stores in the Chicagoland area, but six years later he was laid off. Basilone then went to work for Target Corporation where he was making a solid living despite long hours. It was not long after he and Melissa moved to Portage Park with their two young boys that he started searching for a way to work for himself again. “I was making six figures, it was a really great job but it was killing me,” Basilone said. “I was working 80 hours a week. We had two boys by then (1 and 6 years-old at the time) and it was really hard. So, when I was still working for Target, we started looking around. I always wanted to get back to running my own business. Melissa was also looking for something else to do,” Basilone said. Perkolator Coffee with the People Spot benches to the right of the building. The Basilone’s also rented the storefront two doors west of Perkolater to store items and use as an office for their expanding business. 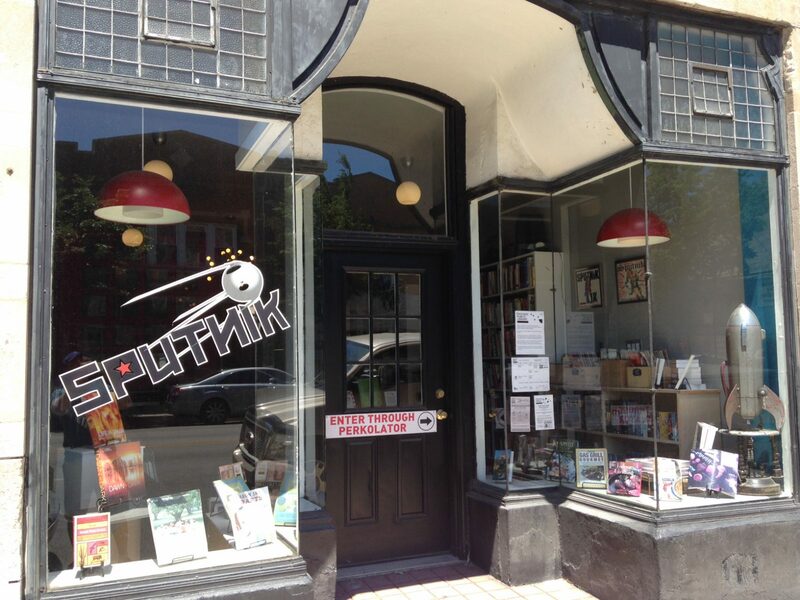 Then in October 2015, the storefront in between the office space and Perkolator became available and the Basilone’s snapped it up, using it to open Sputnik Books & Records. The shop pays for its rent but likely wouldn’t survive without Perkolator. Perhaps just as importantly, having the storefront gives the Basilones the option of one day expanding the coffee house. Along with running their businesses and raising their boys, now 7 and 12, the Basilone’s remain very active in the local community. Perkolator, which is open 7 days a week, also is a presence at both the Jefferson Park and Portage Park Farmer’s Markets on Sundays. This year, in order to spend time with their boys, the Basilone’s have decided to rely on their employees a bit more at the markets. Pressing the flesh is something Joe is great at. Every day at Perkolator he comes out from behind the counter to greet customers like a politician. In fact, Joe often has been jokingly referred to as the “mayor of Irving and Austin,” and said getting into politics is something he does consider from time to time. “Some days I think about it more than others,” Basilone said. “In order for me to run in the 38th Ward [where the Basilone’s businesses are], we’d have to move our home because they recently redrew the district and we are now two blocks outside of it. The current administration [in Washington] proves that business people should be business people and politicians should be politicians. I see how you can effect change at a local level and I want to be part of positive change, but as a kid and a student I was never a history guy. I’m really good at talking to people, I’m good at delivering on my promises. These are things that I do as a business person all day long, but I’m just not a politics guy. That said, I’ll never say never,” Basilone said. While Joe ponders a possible future run in local politics, Melissa has been working on a grassroots movement to improve their business neighborhood, serving as the director of the Irving Austin Business District. Melissa helped form the group 5 years ago with the former owners of the nearby Patio Theater and the owner of Regulus, the coffee shop that was formerly in the Perkolator location. One of the big accomplishments of the IABD was the completion of a $500,000 streetscape project to improve the area, which Melissa spearheaded and received help from former 38th Ward Alderman Timothy Cullerton. 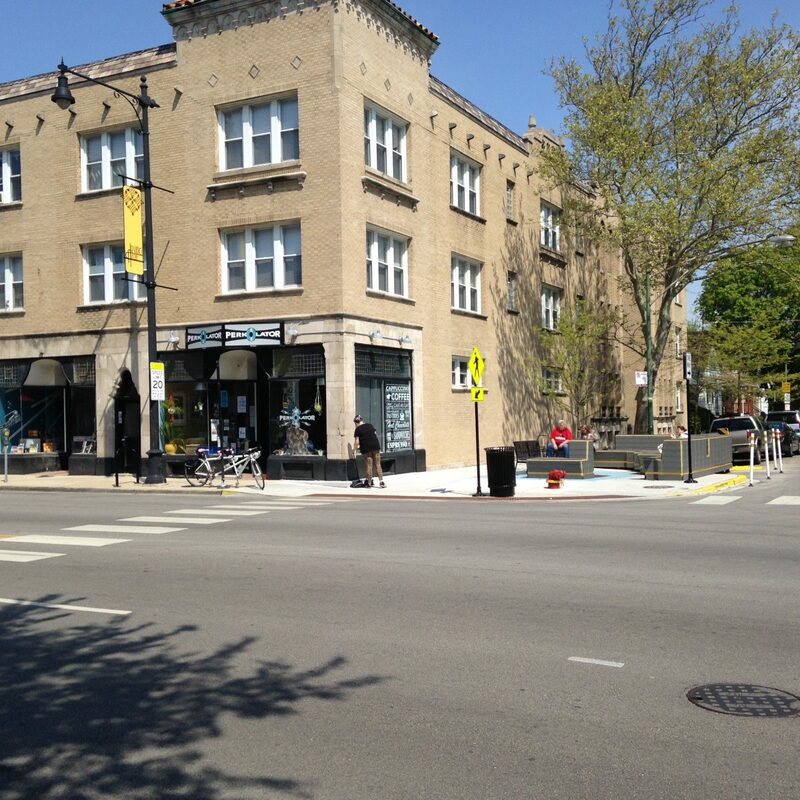 Part of the project resulted in a People Spot being installed on the corner of Irving Park Road and McVicker Avenues, next to Perkolator, where people can sit and relax. The former owner of Regulus, Brenth Bogseth, closed his shop [which enabled the Basilone’s to eventually open Perkolator], moved to Michigan and is now serving a life sentence for murdering his wife. The owners of the Patio who were part of the IABD have since sold the theater, which remains a open question for residents and according to Basilone, an excuse for some business owners. Local art is installed at Perkolator. The theater was owned by the Kouvalis family for 28 years until being bought in 2015 by Eddie Carranza, a theater owner with a controversial history. The liquor license at Carranza’s Congress Theater in Logan Square was was revoked in 2013 after several illegal incidents involving drugs and his former stewardship of the Portage Theater drew criticism from 45th Ward Alderman John Arena, who called his ownership “a recipe for disaster” before Carranza ultimately sold it in 2015. What is happening is the opening of yet another Basilone business — Charley Noble — a deli at 6011 W. Irving Park Road. According to Basilone, Charley Noble was an old sea captain, who upon learning that the stovepipe in his gallery was made out of copper, was diligent about having his team keep it spit shined all all times. They hated doing it so much that they began referring to the stovepipe as Charley Noble. Whether or not the story is true, Basilone couldn’t say, but he liked it enough to name his newest venture after it. With three businesses operating already, Melissa said she was a bit hesitant when Joe proposed the idea to her but has since fully come on board. “He came up with the idea around Christmas and I said ‘that’s not what I wanted for Christmas, a new business!’ I was a little trepidatious at first but I trust him because he has a background in restaurants. If we didn’t do it someone else would do it and we know it’s going to be successful and the more options there are in the Irving and Austin area, the more of a destination it will be,” Melissa said. Joe Basilone said it’s going to be a family friendly deli with elements of classic Italian and Jewish delis, but noted he does not intend to bring Chicago a New York deli — the type he grew up in — nor a Chicago Italian deli — something he feels he’s not qualified to run. “My family ran an Italian deli in New York. I’m not enough of an old-school Italian to run an Italian deli. Italians in New York and Italians in Chicago are two different people,” Basilone said. “We are all the same but there are so many cultural differences. I’ve learned enough to know that I can’t run a Chicago Italian deli because I’m a New York Italian and that nobody in Chicago wants a New York Italian deli. We are going another route. It will have elements of a classic Italian deli, but it will also have elements of a classic Jewish deli and elements of a modern sandwich shop but it won’t be so trendy that it won’t be conducive to neighborhood people because lets face it, we are on the Northwest side. We don’t live in Logan Square, so we don’t want to scare our neighbors away,” Basilone said. “That said, some do want something creative, modern and inventive so it’s going to be a delicate balance. We’ll have seating for about 15 people, a counter at the windows low enough for kids to sit at and some tables. We try to design our spaces with kids in mind. It is not going to have free WiFi, it’s not going to be Perkolator. If you want to hang around for a couple hours and have a coffee and use free WiFi, please go to Perkolator. If you want to grab a bag full of subs and head back to the construction site, come to the new place. We’ll also be open for dinner. We’ll be open from 11-8,” Basilone said. The Basilone’s may be running three successful businesses and on the verge of opening a fourth, but Joe says talk of expanding to other areas isn’t something that he desires right now, preferring to help keep improving the Irving and Austin business district. 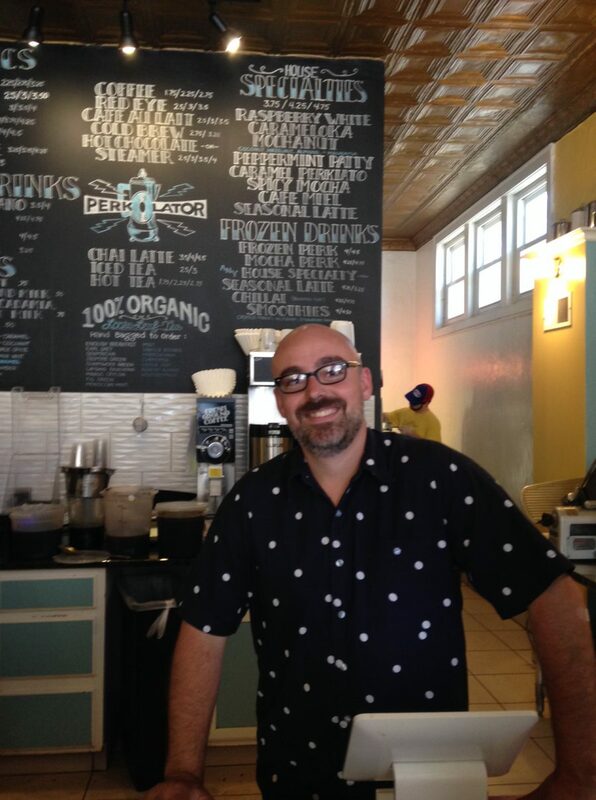 Along with running their businesses, building the neighborhood is something both Joe and Melissa are passionate about. Another way the Basilone’s help the neighborhood is by giving local artists a chance to exhibit and sell their work at Perkolator. Initially they put out a call on social media for local artists but eventually local photographer Frank Styburski curated the exhibits, leaving the Basilone’s to focus on running their businesses. 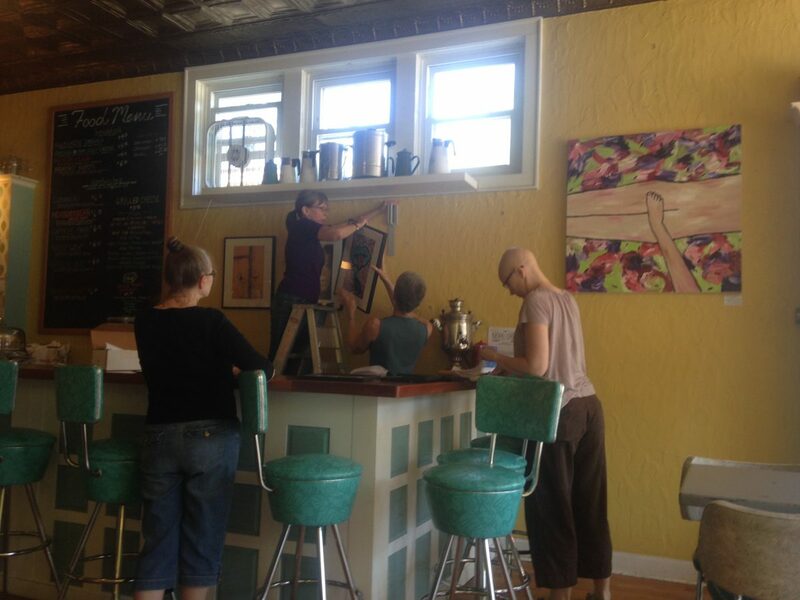 After about a year, local artist Sara Peak Convery took over, changing the artwork every 4-6 weeks. Artists price their own work and sales are directly between the artist and buyer. It is an opportunity to show work without fees or commissions, which Convery said is unusual. And the customers seem to love it, she said. “Joe has always shown excitement and exuberance for seeing the new shows. On the rare occasion the walls are uncovered for a day or two, the customers always seem appreciative and relieved to see the next show,” Convery said. Although his businesses have been successful, Joe said he still has a hunger to learn, recently being accepted into Goldman Sachs’ 10,000 Small Businesses program, attending with Chicago Mayor Rahm Emanuel and Goldman Sachs CEO Lloyd Blankfein along with other small business owners. Perhaps the biggest lesson Basilone has learned is something that isn’t taught in any school or business program — it’s to do what you love and the money will follow. Joanna Janczurewicz is someone who left corporate money for what she says is a healthier environment, working for the Basilone’s since October 2015 after leaving a high paying job at 34 as program director at Northwestern University because it wasn’t fulfilling her personal goals. A regular customer at Perkolator, Janczurewicz inquired about working at Sputnik shortly after the Basilone’s opened it but her timing was initially bad. “They had just hired someone but a couple weeks later they needed someone at Perkolator. I got hired in October 2015 and became their manager of business operations in April 2016. The dynamic of working for a married couple is a lot different than working in a corporate atmosphere. It’s a lot of fun, but it also has to be a business. It was a little tough to implement a business system initially because it’s like a family, but because it’s like a family they really care. You’re not going to make corporate money, but it’s a fun, healthy environment,” Janczurewicz said. Ensuring things are professional and fun is something that go together for Basilone, who said you need both to be successful financially and spiritually. He added that working hard and enjoying it is something he learned early on and something that enables him to enjoy what he’s doing and what keeps him going.